This House Supports Our Troops Scroll Saw Pattern. 2,266,883 troops serve in the U.S. military (including active duty, National Guard, Air National Guard and reserves.). These include folks from every walk of life. 82% are Male and 18% are female. These soldiers are our daughters, sons, fathers, mothers and friends. In many cases the pay is low and the work is hard and dangerous. They are away from home for months at a time. They perform one of the most important jobs in our nation. They deserve our support. If you have the means please support one of the military inspired foundations who support our active duty men and women or veterans. I know there is current news about certain foundations not being above board with their spending. Do your research and choose one you feel you can trust but don't give up because of the corruption. If money is tight then show your support in other ways. When you see military personnel, take a minute to tell them you appreciate their service. Write your representatives and let them know you want the VA issues cleaned up. Small things mean a lot. 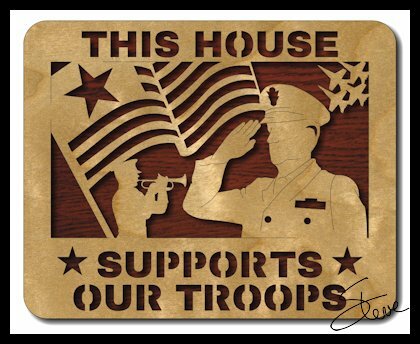 Please support our troops.